I’m with you. I often feel the same. However… haven’t you found that implementation of this type of learning is a catalyst for more meaningful learning the rest of your week? I see student interests and struggles being the basis for what we do the rest of the week, and I find myself giving more and more over to the students. We have curriculum I “have to cover,” but knowing students’ interests and strengths, I can use these to improve my lessons. Knowing their struggles, I can use that information when figuring out how to present the lessons, or how students can tackle them. It seems, too, that now, when students ask, “Why are we doing this?” I actually have an answer that shows that the learning IS relevant to them. I find that I cannot spend our time anymore on anything that will not be relevant to their lives / their learning. Do you find the same? thanks for your jumping in! I absolutely agree that developing these opportunities for students is definitely a catalyst to push more meaningful learning across the week. I just think there should be less of the stuff we “have to cover” and more learning that is real, relevant and connected. In our school teachers are teaching 5 different classes of students from year 8 to 12 and not always for the entire year. Getting to know their passions, interests and strengths and working to personalise the learning is definitely a challenge. I believe that if we created opportunities for our students to get stuck into real projects over a term across different curriculum areas, we would see some fantastic outcomes and increased engagement. I have always pushed “why” and I write this as I laugh at the multiple times that my team have preempted this before I get the chance to ask. This is exactly what I am doing here; asking why it has to be this way. 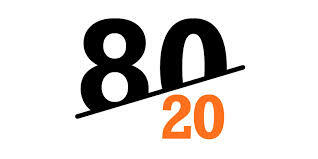 I see so much learning occurring during our 20% time, why shouldn’t it be 80%?